What in the world, you might be wondering, is a yarn tasting? It sounds like it might not be that good…but of course yarn tastings are as delicious as any other tasting! This is a chance to taste/sample/try out a new and fabulous fiber or colour, who wouldn’t love that? And of course, it’s especially nice when paired with a little wine. Urban Yarns is hosting a Fleece Artist and Handmaiden Fine Yarns yarn and wine tasting on July 26th. Tickets are $10, which can be put towards any Fleece artist or Handmaiden purchase. Give us a call or drop by to get your tickets and we will see you Thursday! This entry was posted on Friday, July 20th, 2012 at 9:21 pm	and is filed under Uncategorized. You can follow any responses to this entry through the RSS 2.0 feed. Both comments and pings are currently closed. We are arriving in Vancouver from Colorado the afternoon of the 26th. 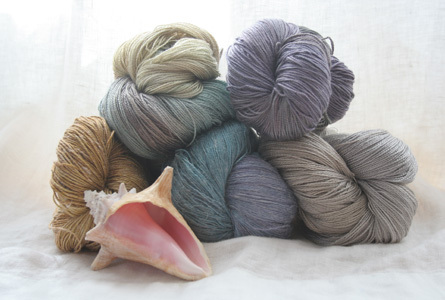 My LYS has offered Casbah from Handmaiden in the past, but hasn’t carried any in a while and I would love to get a hands on experience of some of their other yarns as well. What time is the yarn tasting? And until what hour are you open that night? Thanks ahead for your reply! The yarn tasting is from 7-9!